In the case of land managed to produce the political commodity — “protection” — the opposite is true. The more devastated and barren the land, the more effective it is as a means of soliciting donations and political support. Instead of indicating failure, seventy years of zero on those abandoned transects can be used to prove the need for more protection. 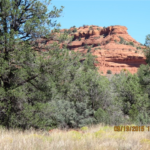 In other words, under protection, land that remains in bad shape or deteriorates even further provides a means to greater reward and longer tenure. The problem here is that the people who logically would be most interested in blowing the whistle on those failures (and most likely to do something about them) are those of us who consider ourselves to be most concerned about the environment — environmentalists. In the vast majority of cases, they are the very same people who have contributed to these disasters. Fat chance of them blowing the whistle or holding themselves accountable. The good news is there are some environmentalists interested in increasing and improving the health of the environment rather than merely using what’s wrong with it as a source of blame and finger-pointing to wage politics and solicit contributions. 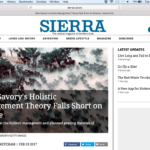 In fact, there are enough of these contrarians to cause the Sierra Club to publish an article, recently, to discredit Allan Savory, a former Provincial Game Officer from Africa who is promoting the idea that humans adapting and mimicking natural synergies can restore and sustain the health of those ecosystems. Environmentalism thus reveals itself to be guilty of the very sin it was created to solve — pursuing not-for-profit profits and political power at the expense of the environment.